example of a of a mock therapy session on “Defense mechanisms“. and a great job by the participants of this video. ‘Active’ because the listener stays focused on what is presently heard in real time (here &now). ‘Reflective’ because replies are meant to be minimal and passive. Coersive response during active reflective listening allow the other speaker to explore or clarify what he has spoken. responses are kept minimal,allowing the speaker to be free and control of his language. Colloquially, defense mechanisms are the common responses, including thoughts and actions, (and perhaps attitudes) one experiences when he/she feels threatened, fatigued, unconfident, or insecure. Usually they are useful, some can be replaced, or new ones can be learned. A key factor of understanding ones Defence mechanisms is being aware of them, as one experiences them. Talking and listening is an excellent exercise. Would you like to improve your listening and conversation skills? on the other hand you feel_______ because you think________. Good listening is like data collecting. One lets go of bias and preconceptions, and refrain from making judgements and opinions. Responding, is clarifying and confirming he/she is listening to what someone is saying to him. what that means to you. What have you tried before? How do you usually make this kind of decision? What do you think the consequences would be? Some years ago I took a class in “Active and Reflective Listening” for volunteer work I was doing at the time. I use those skills, including the statements above all the time, today — they are part of my way of conversing. I am a much better listener today. If use some of these in your conversations and you can if you can be a better listener. 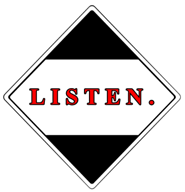 “Reflective Listening” is using effective active listening skills, that encourage orderly communication and allow one to listen as objectively and un-coercively as possible to another who is speaking. Often when one is listening he or she feel compelled to respond. Without realizing, one is introducing his opinion, experiences, advice and assertions. these “Roadblocks” are statements by a listener that impede the progress of reflective listening. Learning to avoid and abstain from “Roadblocks” as much as one can, will make a person a better listener. Some would argue it is better to allow a person to be his or her own problem solver. Giving an advice may make someone depend on advice, have an excuse if the advice another gives didn’t work out, or they may spend more time debating whether its good advise or not, rather than problem solve themselves. These statements can make someone feel guilty or obliged, and don’t encourage or clarify communicating. While it might clarify a speakers motive, it may sound threating or confusing. and if one is wrong, it simply impedes communication. Lecturing and using logic is a good idea if you are debating or trying to get your point across, not so good for being objective and open to listening. Statements like this can make people feel inferior or dependent on someones value judgment. these statements can also cut off communication. Reassuring isn’t so bad. We want to make people feel better immediately with some words or reassurance. However, as an active listener, one will probably notice that using reflect listening (“you are feeling”..) is more encouraging and empathetic. “wouldn’t it be best if” “Do you dislike that person...“? A leading question leads the speaker to answer a particular way. Although direct ,they can interfere with the objectivity and neutrality of listening. Simply says that one is not interested in listening, right now. I took a training course in active and reflective listening skills some years ago, and like most people, I found it difficult not to use these “Roadblocks”. while listening in a conversation. It just seem natural to talk of my experiences … and t sometimes that does makes for good casual conversation. However when listening is important, its ok to say nothing. If one is compelled to say something, why not use reflecting and open ended question that are part of listening skills . Sometimes what one abstains from saying is as important as what he or she says. This list of “roadblocks ” are based on the work of Thomas Gordon‘s P.E.T. and L.E.T. If one wishes to be a good observer of facts ,one withholds judgments, interferes as little as possible with data, and summarizes what he observes. One must do the same when he or she is listening to what others are saying. One can do this with “Reflective Listening“. listen fully, clarify understand what another person saying. build trust and a repore with other people. Listen Closely To What is being said, and How something is said. Pay attention to nonverbal cues: gestures, voice inflections. Respond to What you hear, and Nothing else. Reflecting tells the person who you are listening to that you understand them, and allows you to passively challenge statements for clarity. Correct me if I, Wrong , but i hear………. The part I understand is….. Statements, that start like this are known as “Tentafiers” and they avoid introducing any opinion, advice, or talk of your experience. Remember: this is about better listening and listening objectively. Speaker: Its my brother. He borrowed th car again without asking. He never shows up on time. Never helps me when I ask for his help. and now he is asking to borrow money again. Listener: “It sounds to me, that you believe your brother is taking advantage of you”.. Sometimes people talk to get things “off their chest”, or the just need someone to talk to. They may not notice how they are feeling as they talk. Pointing out feelings and values when you here them, challenges the speaker to experience them, more directly as they communicate. It also tells the speaker “Hey! I know how you Feel” and “I want to know how you are feeling”. I hear you saying that, part of you feels….. and part of you feels…. Its helpful to have Strong “Emotional Grammar” and Empathy in answering these Tentafiers. The good news is mastering Listening helps to improve ones Emotional Grammar and Empathy. Speaker:“I just got a raise at work and my vacation plans were approved! I made record time on my drive home! I’m on a roll! One doesn’t want to intrude on a speaker when he/she is active – reflectively listening, but we may want to encourage the speaker to clarify what they or saying or talk more specifically about a subject. ….what that means to you. Questions that encourage clarification and specification, that don’t lead the speakers to conclusions , are called “Opened ended questions“. Have you felt this way before? Which concern seems most important right now? It is Recommended that “Open ended Questions” are be used sparingly after reflecting and listening for a while. Road blocks are statements one tries to avoid as they are nonconstructive to listening.One don’t wish to interject our opinions, experiences, and advice while listening. I will cover road-blocks in the next post. Summarizing is a good way to express that you’ve been attentive in listening and that you clearly understand the major points the speaker expressed. Active Reflective Listening was developed from the work of Carl Rogers Client Centered Therapy. Reflective Listening is used professionally by Law enforcement, EMT, who need to listen to people for facts quickly, business people with clients, etc. It can be use personally to improve oneself and relatedness to friends and family. After all, most people like “Good Listeners”.